Figure 4-50. 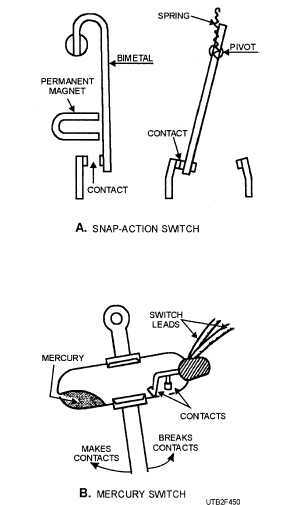 - Electrical switches: A. Snap-action switch; B. Mercury switch. heating plant. It transmits the indicating signal to a primary control for action. This indicating signal is initiated by closing or opening electrical contacts in the thermostat. Thermostats often differ in construction according to the type of primary control with which they are to be used. Probably the most used thermostats are the spiral-bimetallic type and the mercury-bulb type. An electric clock thermostat has the additional features of an electric clock and an automatic mechanism that can be adjusted to change the thermostat setting at a desired time. For instance, it can be adjusted to reset the thermostat automatically from 80F to 60F at 11:00 p.m. (when 80o F heat is not needed). Then it will reset the thermostat to 80o F at 6:00 a.m. (when more then 60F heat is needed). The location for the thermostat should be representative of that part of the building in which heat is needed to maintain a comfortable temperature. The best location is on an inside wall, just a few feet from an outside wall and about 4 1/2 feet above the floor. The thermostat wiring must conform to local electrical ordinances. To check the calibration of a thermostat, hang-an accurate test thermometer within 2 inches of the device. Allow 15 to 30 minutes for the thermostat and thermometer to adjust themselves to room temperature. The thermostat contacts should close when the control knob or dial is set at the temperature indicated by the test thermometer. You should not try to recalibrate the thermostat if the closing point varies 1F or less. When calibration is necessary, follow the manufacturer's instructions. Since there are many types and makes of oil- and gas-fired warm-air furnaces on the market, detailed assembly instructions to suit all makes and types cannot be given in this manual. However, some general instructions, which apply to both oil-fired and gas-fired furnaces, except as noted, are given below. Carefully follow assembling instructions included with each furnace or blower shipment. Each piece or casting is manufactured to fit in its proper place. Parts are seldom interchangeable. Install furnaces in a level position. If the floor is uneven, use a steel wedge, a cast-iron wedge, or the leveling bolts provided on some equipment. Use a spirit level to make sure the unit is level. Gas-fired and oil-fired forced-air units, which have the blower below the heating element or combustion chamber, should be set on masonry at least 3 inches thick and extending at least 12 inches beyond the casing wall. Install all other units on a cold masonry floor. Provide enough clearance to permit easy access for repairs. Make the clearance at least 18 inches from wood or other combustible material unless you install an asbestos board at least 1 inch from the combustible material. Units may be installed near masonry walls; however, leave ample room to permit proper servicing. Furnace cement is furnished with each cast-iron furnace. Seal all furnace joints with a liberal amount of furnace cement between sections to ensure the furnace is gastight. Asbestos rope is furnished with a number of furnaces; follow the manufacturer's instructions covering its use. See that projections from the furnace, such as the smoke pipe or clean-out doors, extend through the outside of the casing.